Coming off the sensational Chain of Command TNG's next two-parter had some serious shoes to fill. By focusing on fan-favorite characters Worf and Data, and throwing in some nerd-tastic cross-promotion, the creative team's ensuing sixth season effort definitely aimed directly for the hearts of viewers. But did it ultimately hit the mark? That's the quandary facing hosts Cam Smith, Tyler Orton and special guest Gena Orton this week as they revisit Birthright. 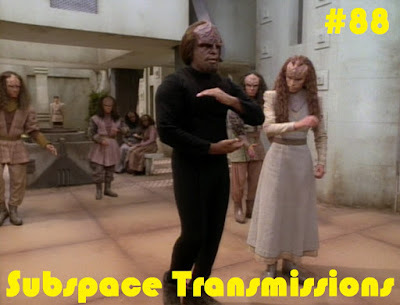 With its android dreams, Klingon yoga, DS9 cameos and potentially age-inappropriate romance, is there enough substance to live up to the more epic extended stories, such as Chain, Redemption and Best of Both Worlds, that preceded it? Or is it just plain old forgettable? Listen in and find out which side of the line the podcasting trio come down on! Wanna appear on the show? Shoot us a 30 to 60-second audio clip telling us your thoughts on BIRTHRIGHT and you could take the spotlight in an upcoming program! You can also send any other questions, topic ideas or feedback to subspacetransmissionspod@gmail.com! Join us next week as we tackle Star Trek anthologies!